Today is the last day of my Belghast experiment and I can draw my conclusions now. It takes me entirely too long to blog at night, about 1.5 hours. I don’t have the time and the energy to blog every night. As I probably mentioned many times before, my spouse had a horse riding accident in March when her horse spooked and she landed on her right foot, snapping the ankle. It’s now 2.5 months later, and she’s still not on her feet, though she is allowed to put 20kg weight on the foot now. She will probably be allowed to walk without crutches in another month. That’s a long time to be sitting on the couch. She pines for her horse like I pine for delicious food and awesome games. Actually, she pines for him more. So today right after work I picked her up at home and drove her to the barn, where she spent happy time brushing her horse while I played Candy Soda Crush. I have been stuck on level 145 for two weeks, it’s driving me insane. It’s really hard for me to understand why she pines for her horse that caused her to have such a grievous injury. I mean, the wound where the bones broke her skin is still not completely healed. Horse riders are strange folks, honestly. I honestly can say that I had never heard of this game before, like ever. 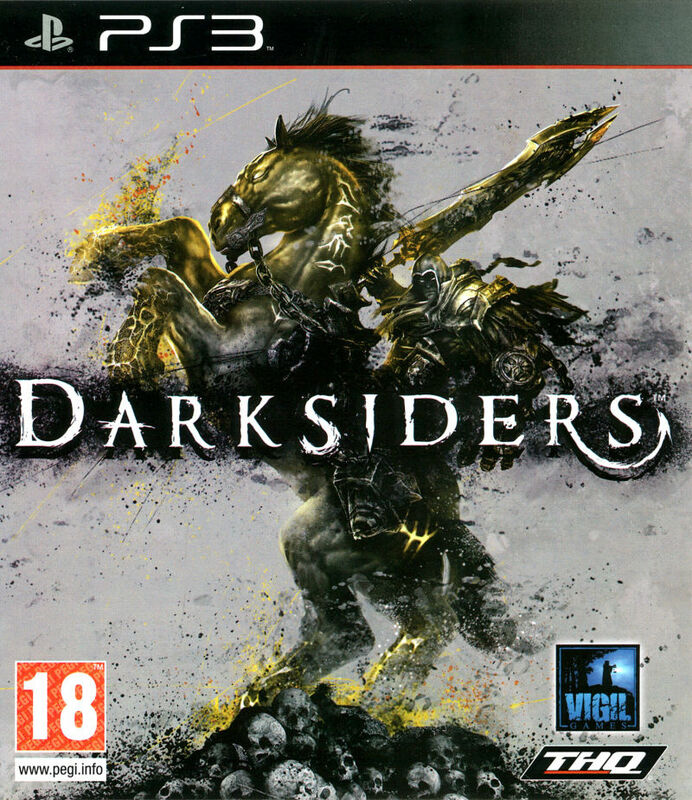 I thought I know pretty much most PC releases, but Darksiders totally flew under my radar. It’s from early 2010, which is when I was playing Dragon Age: Origins more than any other game. I think as a game, it’s far more suited to a console than PC, so I am happy I am only playing it now. You’re War, one of the Four Horsemen, and at the beginning of the game, you are tricked into starting the apocalypse which brings about the demise of humanity, and the forces of Hell beating the forces of Heaven. Accused of having done ill, it’s up to War to prove that it was not his doing. You do so by swinging a giant sword, jumping and running and exploring. 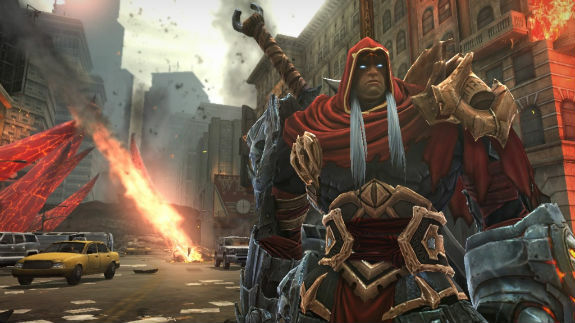 It’s as if Diablo had a love child with a jump and run game, as far as the combat game play goes and the aesthetics of an Earth ruled by demons and devils. Arthas’ love child with Jaina? We’ll never know. Oh, there’s also chests you can open, treasures and weapons to collect, Zelda style. It’s a little bit of everything. It’s a bit cartoony, it definitely is incredibly gory, and I am having fun hacking and slashing my way through it. So far I can’t fault my RL friends with their PS3 recommendations, games have all been quite excellent. As mentioned in the title, we’re having a long weekend. It’s Pentecost, another religious high holiday, and we love ourselves our public holidays in spring and early summer. No work on Monday, hooray. I am looking forward to another much-needed break. So far, we don’t have a lot of plans. Tomorrow, we’re trying to buy Thai and Indian spices at the Asia grocery store, then pho for lunch. At least that’s the plan. On Sunday, we have an invitation to have barbecue at a good friend’s house, friends who we haven’t seen for a looooong time. That night there’s also the company anniversary party, but I am not sure yet if I’ll go. No plans for Monday, though maybe friends will come over. We’ll see! I have a lot of reading to do, because I am behind my Goodreads challenge goal this year, oy. It really doesn’t help that I am not digging The Quantum Thief as much as I’d hoped to. I also need to start prep work for next week’s Pathfinder session. But more on that in another post. Hope you’ll have a great weekend, long or regular. Because years of having the speed of a horse is worth three months off. Even if I whine.